There is a new British Columbia wine that you can give to friends who are either equestrians or Civil War buffs. A Merlot-dominated red blend called Traveller, it is one of two wines just released under a new label – 3 Cru Wines. The other is a Gewürztraminer-dominated white called Nomad. Priced at $20 each, they are made by and sold through Kalala Estate Organic Winery in West Kelowna. 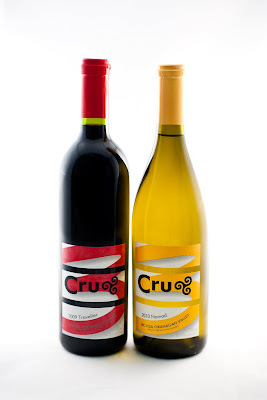 3 Cru is the label of Mariposa Vineyard Limited Partnership, a new organic winery project being developed in the Similkameen Valley. A 20-acre vineyard was planted this year by the three partners: Jacques LeCavalier, a Kelowna education consultant; Thomas Kinahan, a Kelowna physician; and Karnail Singh Sidhu, the principal owner of Kalala. The connection between the red wine and equestrianism is unintended coincidence. It is unlikely that the partners behind the winery knew that they had named a wine for perhaps the most famous horse in American military history. Traveller was the horse of Confederate General Robert E. Lee. There is an engaging 1988 novel called Traveller by Richard Adams, the author better known for Watership Down, a novel in which rabbits are the protagonists. It is a “first person” novel told, convincingly, in the voice of Traveller. The horse, originally named Jeff Davis, was born three years before the Civil War began and became a military horse only after one of his owners joined the Confederate Cavalry. It was there that the horse caught the eye of General Lee, who purchased him and renamed him Traveller. The general rode the horse in numerous battles. After the war, when Lee became president of a college in Virginia, he took the horse with him. By that time Traveller was so well known that souvenir seekers pulled hairs from his tail. When Lee died in 1870, Traveller was in the funeral procession behind the caisson, his saddle and bridle draped in black crepe. The horse died of tetanus the following year and was buried on the grounds of the college. Bizarrely, the bones were unearthed, bleached and put on display in Rochester, New York, until 1907, when they were returned to the college and displayed in a museum there. Because the students began carving their initials in the skeleton, it was moved to the basement. Finally in 1971 the skeleton was buried near the Lee family crypt, also on the college campus. 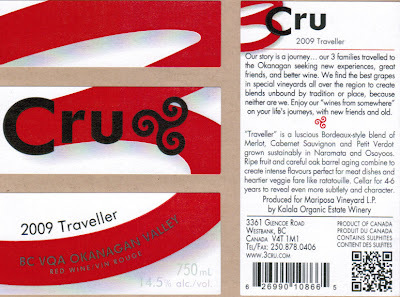 Traveller, which I have not tasted yet, and Nomad, which I have tasted and enjoyed, were released last month at a special Kelowna tasting dedicated to the organic wines made by Kalala. In the past decade, Karnail Singh Sidhu, who opened Kalala in 2008, has become one of British Columbia’s leading authorities on organic viticulture. He was consulted for his expertise a few years ago when LeCavalier asked him to look at raw land in the south Similkameen that had come up for purchase. Sidhu advised that it would be an excellent vineyard and then agreed to partner with LeCavalier and Kinahan in developing the project. The Kelowna tasting also included some of Kalala’s current releases. Here are notes on several of wines. Kalala Pinot Gris 2009 ($17.95). This is a soft, fruit wine with aromas and flavours of cantaloupe and apples and with an herbal, spicy note on the finish. 87. Kalala Riesling 2008 ($16.95). This dry Riesling has both the aromas and the flavours that tasters call, for want of a better term, “petrol”. This is a style that appeals to Riesling connoisseurs. 87. Kalala Gewürztraminer 2009 ($17.95). The delicious dry Gewurz has classic spicy aromas and intense flavours of lychee and grapefruit. 88. Kalala Rosé 2009 ($17.95). The wine, which has a good dark hue, begins with aromas of plum and cherry. It has flavours of cherry, with an austerely dry finish. The alcohol, at 13.8%, is a hair high for rosé. 86. Kalala Pinot Noir 2008 ($18.95). Here, the 12.8% alcohol makes for a more charming wine, with lovely sweet aromas of cherries and red berries that carry on to the flavours. The texture shows that velvet finesse of the variety. 88. Kalala Zweigelt 2008 ($19.95). This is a medium-bodied interpretation of this Austrian variety, with aromas and flavours of blackberry, black currant and spice. 87. Kalala Merlot 2008 ($28.95). Full and juicy on the palate, this wine has flavours of plums, black currants and black berries, with a long finish. 89.